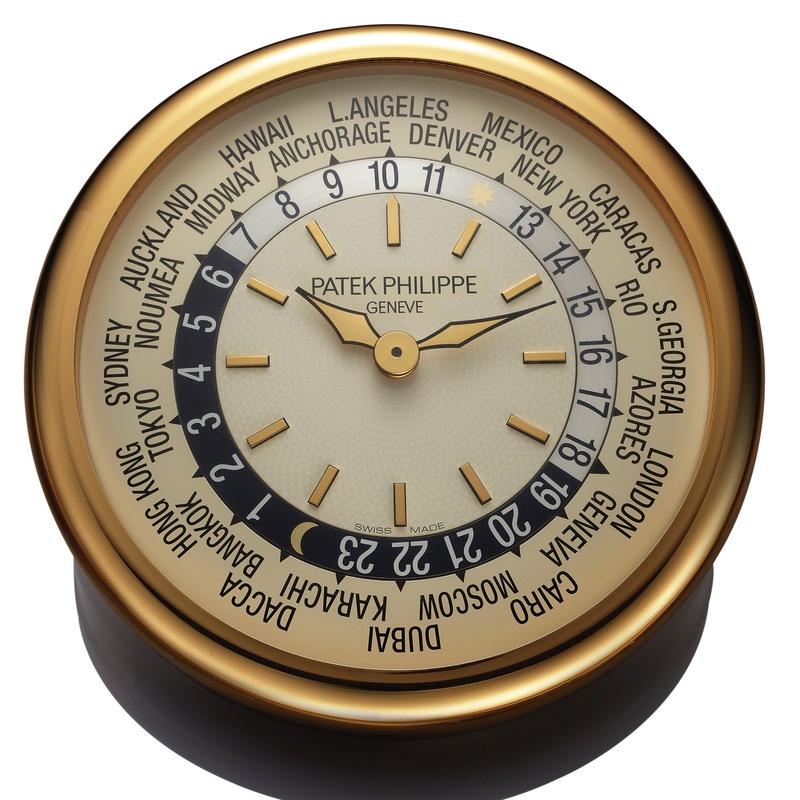 PATEK PHILIPPE LARGE WORLD TIME WALL CLOCK Patek Philippe, Genève, No. 99. Made circa 2003. Fine, rare, and substantial gilt brass wall clock, modeled on the World Time Ref. 5110. Two-body, solid, polished. Plastic with textured guilloche-like, applied gilt baton indexes, surrounded by a black and matte silvered revolving disc in 24 hours for the diurnal and nocturnal hours, outer revolving ring dial bearing the names of 24 global locations. Gilt brass lozenge hands. With quartz standardization, powered by a 12 V battery. D. Plastic with textured guilloche-like, applied gilt baton indexes, surrounded by a black and matte silvered revolving disc in 24 hours for the diurnal and nocturnal hours, outer revolving ring dial bearing the names of 24 global locations. Gilt brass lozenge hands. M. With quartz standardization, powered by a 12 V battery. Signed on the dial. DIAM. 40 cm.